Talented art students from Glasgow’s state secondary schools met the highly successful figurative sculptor, Andy Scott, at a special event in the spectacular City Chambers building on George Square. Mr Scott is himself a former pupil of Bellahouston Academy in the south west of the city. In 2014 he made headlines with the remarkable Kelpies, two giant 30 metre high horse-head sculptures standing next to the Forth and Clyde Canal in Central Scotland. His other public art works include the famous Heavy Horse beside the M8 motorway, the Easterhouse Phoenix and The Shipbuilders on the banks of the Clyde. 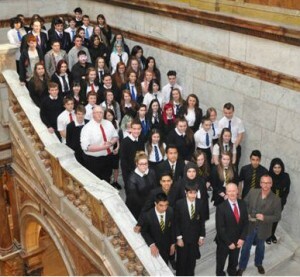 Each of Glasgow’s 30 state secondary schools were invited to send senior art students to the event. 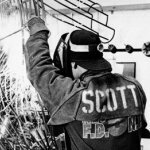 Such was the demand, the size of the group had to be limited to allow the students a chance to meet Andy Scott in person as well as listen to a fascinating talk on his career, his art, and his great love for the city of his birth. Sculptor Andy Scott seen with top art students from Glasgow’s state schools.